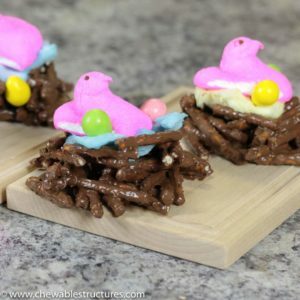 Chocolate covered pretzels are easy to make and fun to shape into miniature bird’s nests to celebrate Easter! 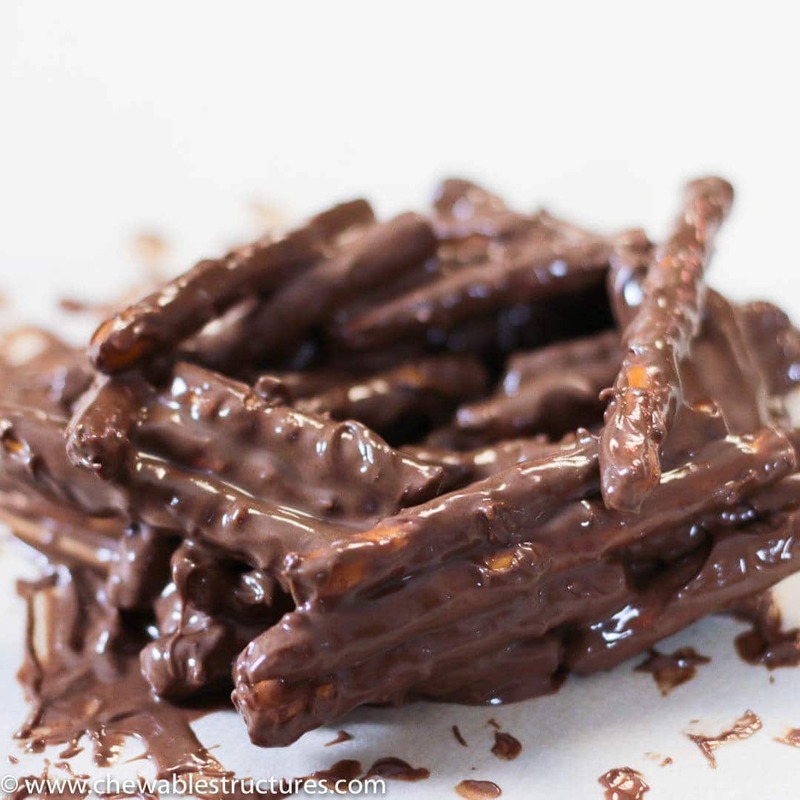 An added bonus is that you only need two ingredients to make chocolate covered pretzels: chocolate and pretzels. To decorate the nest, I’m using Reese’s Pieces eggs, cotton candy, and Peeps. 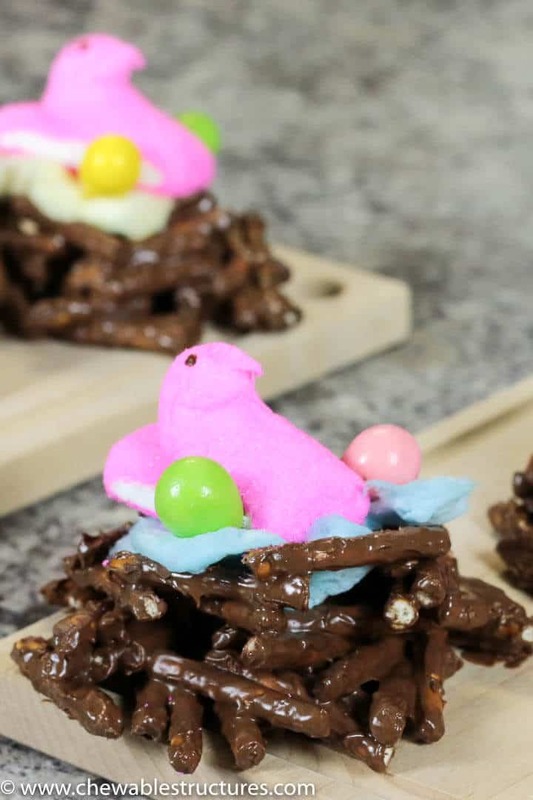 WATCH THE RECIPE VIDEO BELOW to see how easy it to build these adorable chocolate covered pretzel bird’s nests. The first thing you need to do is break each pretzel stick in half. You can melt the chocolate chips in the microwave using a microwave safe bowl. Or, you can use the stove. I’ve burnt many bowls of chocolate chips in the microwave. So personally, I like to melt chocolate on the stove so that I can keep an eye on it. Plus, I love watching the swirls of chocolate disappear as I stir. To melt the chocolate on the stove, fill a small pot with water so that it’s 1/3 filled. Simmer the water on low and place a heat proof metal bowl on top. Add the chocolate chips to the bowl and keep stirring with a spoon until it’s melted. It should take a few minutes or less. It’s a fine dance between melted chocolate and a hardened brown clump. So, resist any temptation to multitask while the chocolate is on the stove. Put the phone down, leave the dirty dishes where they are, and let your eyes drink in the chocolatey goodness. I’m an expert at burning chocolate, so if this happens to you, I hope you find solace knowing that I feel your pain. For these bird’s nest, I’m using milk chocolate, but if you want to mute the sweetness, this recipe works great with dark chocolate too. By now, your room should be bursting with the sweet aroma of chocolate! Good. Now, remove the bowl from the heat and dump in the pretzels. It’s time for the salty pretzels to join forces with the chocolate to make a salty sweet combo! Using a spoon, stir the pretzels until they’re drowning in chocolate. Line baking sheets with parchment paper or wax paper. Place 2 scoops of the chocolate covered pretzels on the paper. Use your fingers to shape them into a bird’s nest. It should look like a circular wall with a hole in the middle. As you can see below, at first glance it looks like a mess. Don’t worry. It doesn’t have to be perfect because you’re going to cover it up anyway. Chocolate covered pretzels shaped like a bird’s nest. It’s a chocolatey mess! Let the chocolate covered pretzels cool in the fridge for 20 minutes or at room temperature for 30-40 minutes. If the chocolate is still wet, let it set for a little longer. You’ll know when it’s done when you touch the chocolate and it’s firm. Finally, transfer the miniature bird’s nest to a serving tray and add the cotton candy, Reese’s pieces chocolate eggs and Peeps to each nest. Since Hammond’s cotton candy comes in a plastic tub, the cotton candy is slightly compressed. So, I like to use my fingers to fluff out the cotton candy so that it looks a bit fuller in the nest. This also helps prop up the Peeps and chocolate eggs. I’m using small cheese boards to serve the bird’s nests. But these adorable nests would also look great on a cutting board, baking sheet or a plate. Happy Easter! Do you like to build other structures with chocolate covered pretzels? I’m curious, let me know in the comments below. Click here to watch more Chewable Structures videos, like this Family Guy House made of caramel popcorn or this Stackable Lego Gummy Pyramid. *** All products purchased by me. Please note that all my links should be considered affiliate links, which helps support this content. Thanks for your support! In a small pot, simmer water on low. Place chocolate chips in a heatproof bowl. Place bowl on top of the pot. Stir for a few minutes until chocolate is melted. Add the pretzels to the melted chocolate. Mix until pretzels are coated in chocolate. Place 2 tablespoons of the chocolate pretzel mix on the tray. Use fingers to shape the sticks until it resembles a bird’s nest. Repeat this step three more times. Let the bird nests cool in the fridge for 20 minutes. Remove the birds nests from the fridge.It’s time to decorate. Place small sections of the cotton candy inside the nest. Add Peeps and chocolate eggs. Enjoy!